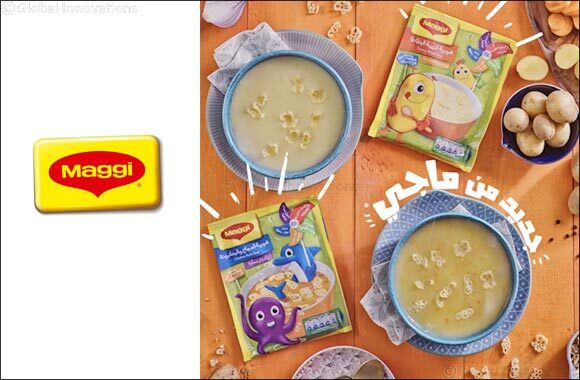 Dubai, UAE - 22 October 2018: With a steadfast commitment to offering tastier and healthier choices to individuals and families, MAGGI is introducing the latest in its Kitchen Cupboard range: special soups for kids that are made solely with ingredients children know and love, and are typically found in the Kitchen Cupboard. Available for the first time in Creamy Potato and Chicken Pasta varieties, these children-geared additions to the MAGGI soup range are free of artificial ingredients, additives, colorants, or flavors, and aim to meet the demand for nutritious and appetizing soups for kids. Made in accordance and compliance with strict international dietary guidelines* for children, the new soups are made of up to one-third natural vegetables combined with playful animal pasta shapes to make them more fun to eat. In addition to simplifying 100% of its ingredients, allowing people to recognize all the items they read on their labels, MAGGI is also adding vegetables, grains, pulses, and other nutritious ingredients to its products – all in pursuit of MAGGI's goal to transform its entire global range by 2020 to only include ingredients people find in their Kitchen Cupboard. “It's always a challenge for nutritious products to be well received and consumed by children, which is why we create our recipes to not only be nutritiously impeccable but also tasty and fun to eat,” explained Kanaan. Earlier this year, Nestl� launched Nestl� for Healthier Kids, a global initiative to help 50 million children live healthier lives by 2030. It includes a commitment to accelerate the transformation of Nestl�'s food and beverage portfolio worldwide, adding even more fruits, vegetables, fibre-rich grains and micronutrients, as well as continuing to reduce sugars, salt, and saturated fats. It also entails offering simpler ingredients lists, as well as more organic and natural options.